If you're a fan of Jennifer Lawrence or Diana Krall, you're bound to become an undying sycophant of yet another woman. Her name is Joanna Kulig. Truth be told, I'm a fan of both Jennifer and Diana's, so that means I've been totally captivated by Ms. Kulig. Whether you're a guy or gal, you too will likely find yourself feeling the same way when you see Pawel Pawlikowski's new, terribly curious and surprisingly relevant film called COLD WAR. Joanna could pass as kin of either Lawrence or Krall. There are a few film critics, fancying themselves sagacious enough, who are nearly ranting about this awesomely non- American motion picture. It was completely, a fresh breath of European air for moi. Speaking of foreign languages, COLD WAR comes mostly in Polish, French – then German and just an iota of The Italian. Even with my eyes, following the subtitles is simply another kind of a breeze. It's also totally noir: yes, just like the old Hollywood detective flicks, but sans Bogies or Widmarks. And, alas, no Bacalls or Bergmans. 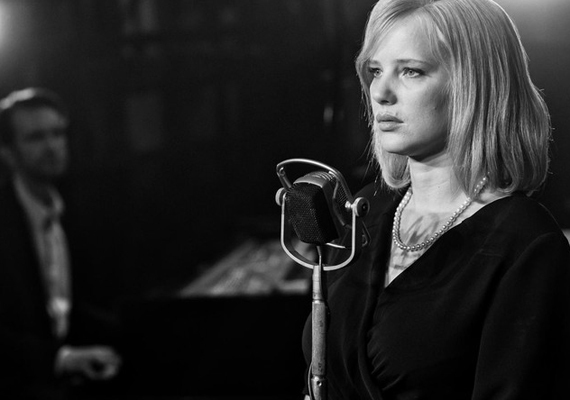 “But we'll always have” Joanna Kulig when Pawlikowski's COLD WAR is beamed up on anybody's screen. That reminds me to say: some of the picture is set in Paris. It's 1949, only three years before Vladimir Putin was born. The Soviets are polishing up Polish citizens from the “sticks,” empowering them to perform for audiences, most often behind the Iron Curtain; also referred to, then, as a WALL. Some of these simple folk have so-so talent, but for Zula (Kulig) it comes in abundance: a great musical ear with a wonderful singing voice, and a proficient dancer who has been gifted with a face that, for young men, is dangerously alluring … including middle-aged males. Enter the middle-aged fellow. He is Wiktor (played by Tomasz Kot). Wikor is a pianist and conductor. Since the big war, he's found himself under the authoritarian/totalitarian thumb of Soviet Communism. The script takes you some years hence from Putin's birth in 1952. It's Stalin in control, early on. The artistic Wiktor first accepts his task for training young folks from the hinterlands for being up to snuff in stage performance. But when told his charges, as they sing those pretty solos and catchy choral pieces, have to infiltrate their quaint songs with lyrics meant to meet the “needs of the People,” Wiktor wants out ... of Poland. The sinking-in effect of such warped artistry comes slowly. But it finally becomes clear to Zula that all is politics. In the meantime, she and Wiktor become intimate and helplessly fall in love. Despite great conflict between the lovers, with subplots running amok among other characters in the story, Wiktor and Zula can't stay apart ... and flee Poland. Wiktor faces nasty consequences at the hands of his “comrades” who are stationed in France and Poland. And Zula foolishly marries an Italian man, has a child and, all the time, is drinking like a fish. She is almost degenerating before the moviegoer's eyes … but all the while, giving good performances in a variety of European venues. She is a spirited trouper. COLD WAR is a visual masterpiece of cinematography and composition. Albeit production values are straightforward and conventional, the film is so visually real, while being beautifully set in the bleakness of Polish mud puddles or along dreary Parisian thoroughfares. The movie's lack of “pretty,” for me, was a refreshment of honesty. It is possible the drab, unpleasant environment of Post WWII that surrounds Joanna Kulig is what makes her visage even more memorable. I saw this one late, but feel compelled to slip COLD WAR onto my best of 2018 list. It is of the same quality as Alfredo Cuarón's ROMA. Copyright © 2019 by Gary Chew. All rights reserved.